Born and raised in Singapore, Livia Gho is very much acquainted with the sounds from both the Eastern and Western world. 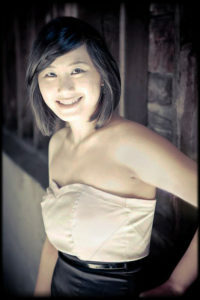 A classically-trained pianist, she is also proficient in voice and the Chinese zither (Zheng). Livia is a graduate of Indiana University’s (IU) Masters in Conducting program and received a Bachelor’s of Music (Composition) from the University of British Columbia, Vancouver, Canada. Livia is the founder of the Women’s Orchestra of Arizona (WOA), Music Director of the Scottsdale Congregational United Church of Christ, and has worked with professional ensembles across the world such as the Vancouver Chamber Choir, Elektra Women’s Chorus, NOTUS: Contemporary Vocal Ensemble, Bacau Philharmonic Orchestra, and has assisted in opera productions such as ‘The Magic Flute’. Livia sang in IU’s top vocal jazz and choral ensembles and had the opportunity to perform in Carnegie Hall and the acclaimed Rose Theatre at Jazz at Lincoln Center in April 2014. She has also furnished studio recordings for Hal Leonard Publishing; her recordings with IU Vocal Jazz Ensemble I has been named the Graduate College Winner in 2014 DownBeat magazine’s 37th Annual Student Music Awards. Livia is sought after as a composer. She has written for the Vancouver Symphony Orchestra, International Contemporary Ensemble (ICE), and the Vancouver Inter-Cultural Orchestra (VICO). Her compositions have been featured in various music festivals and she regularly receives commissions. She is currently working on a commission by the Portland Gay Men’s Chorus.